A historic region that is considered the birthplace of the nation. It includes the second largest city, Porto. The region is famous for its natural reserve of Gerês, Vinho Verde (green wine), the Douro river valley steep slopes covered in stepped wine cultivations, isolated mountain regions and archaeological prehistorical sites around the Mogadouro area. It includes Coimbra, which houses one of the oldest universities (since 1290) in Europe, the Catholic pilgrimage site of Fátima, and several mountains such as Serra da Estrela, the highest mountain in continental Portugal, serra da Lousã, Serra do Montemuro and Serra do Caramulo. Visit São Pedro do Sul and Caldas da Felgueira for their thermal spas. The major wines are Bairrada and the Dão wine. The Mondego river system, most of the Estremadura coast, and a major access road to the rest of Europe via the Vilar Formoso border crossing into Spain. The south of central Portugal, formerly Ribatejo and Estremadura, is home to the "Campino" or Portugal cowboys. The region's main city's are Santarém, Vila Franca's de Xira and Nazaré on the Atlantic coast. The old cattle ranching way of life go hand-in-hand with the Lusitano horse-breeding traditions that can be traced thousands of years back in history. The town of Golegã is the main horse trading center in the country. It organizes a yearly horse and cattle trade fair and festival every November, with roots going back to the pre-Punic War period. Much more than just Lisbon, the capital and largest city, the densely-populated region around the mouth of the River Tagus at the Atlantic Coast includes such famous tourist destinations as Sintra, Cascais, and the South bank regions of Montijo, Barreiro, Setúbal, Palmela and the beach resort town of Tróia. Access to the southern side can be through the 25 de Abril suspension bridge on the west side or via the Vasco da Gama bridge in the east, spanning the Tagus estuary over 15 km in length, as well as on boats, known as the "Cacilheiros". The region literally called "beyond the Tagus river" is sparsely populated, known as the warmest in the country with the flatest terrain, celebrating its slow pace of life. While largely rural with large agricultal estates amidst rolling prairies, cork oak forests and olive tree groves, interesting cities and towns like the regional capital Évora dot the country side. Also, there are some prehistorical, Celtic-Iberian and Lusitanean culture archeological sites and monuments like menirs and "Antas". The beaches and sun of Southern Portugal and Sagres in the southwestern tip, chosen by Prince Henry the Navigator, to set up his headquarters and launch Portugal's maritime adventure. A group of islands in the Atlantic Ocean. Pico, the highest mountain in Portugal, stands on the island with the same name. A sub-tropical archipelago that is made up of two populated islands, Madeira and Porto Santo, and two groups of unpopulated islands called the Desertas and Selvagens Islands. 40.211111-8.4291674 Coimbra – home of the ninth oldest university in the world. An Alfa Pendular train arrives at Oriente station in Lisbon. Rede Expressos bus ticket offices. Rede Expressos bus in Lisbon. The 25th of April Bridge is the main road access between the north and south of the Tagus River. The way from Cabo Espichel to the Arrábida mountain and beaches coast. Pena National Palace, in Sintra: it's one of the major expressions of 19th-century Romanticism in the world. The luxurious Cascais village in the Portuguese Riviera (Estoril Coast). 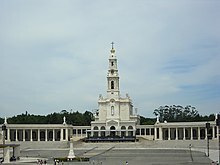 Sanctuary of Our Lady of Fátima: this is one of the largest pilgrimage sites (Marian shrine) in the world. The Marinha Beach, in Algarve, was considered by the Michelin Guide as one of the 10 most beautiful beaches in Europe and as one of the 100 most beautiful beaches in the world. Caldo verde: the green broth is a very popular soup in Portuguese cuisine. Bacalhau à Brás: salt cod with onions, scambled eggs and fried potatoes. Sardinhas assadas: grilled sardines with potatoes and salade. Cozido à portuguesa is prepared with a multitude of vegetables, meat, smoked sausages, among others. Is one of the national dishes of Portugal. The original pastries of Belém (Pastéis de Belém) in Lisbon. Traditional pastries from the Algarve region. Portuguese drinks: Brandy from Douro, and Porto and Madeira wines. Porto city and its famous wine. A glass of tawny (Porto) port wine. 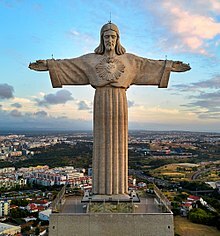 The Christ the King monument, in Almada, symbolizes the profound Christian-Catholic identity of Portugal. This country travel guide to Portugal is an outline and may need more content. It has a template, but there is not enough information present. If there are Cities and Other destinations listed, they may not all be at usable status or there may not be a valid regional structure and a "Get in" section describing all of the typical ways to get here. Please plunge forward and help it grow! This travel guide page was last edited at 17:09, on 22 March 2019 by Wikivoyage user ThunderingTyphoons!. Based on work by Wikivoyage users Mx. Granger, Traveler100bot, ARR8, DaGizza, Matroc, Ground Zero, AndreCarrotflower and Ibaman, Wikivoyage anonymous user 86.154.78.225 and others.